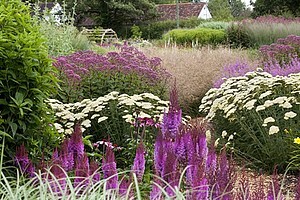 "Sussex Prairies is six acre garden, planted in the "Naturalistic," or "Prairie," style. We have over 30 000 plants in the garden and what can only be described as a skeleton staff! Two gardeners to maintain the whole thing! For this reason we always look for the least labor intensive maintenance regime available to us, and this is where our friends at Olus come in. We rely upon a spring mulch application of Olus compost to reduce our summer maintenance to a weekly weed patrol. In February we cut down, and either chip or burn the remains of last years plants. We then apply 10-15 cm's of Olus compost to the entire bed, some 1200 tonnes! The compost is slowly mixed into the soil by worm activity, improving soil structure. Weeds seeds from last year do not penetrate the thick mulch. Superb aesthetic finish to the beds." Pauline McBride of Sussex Prairies.